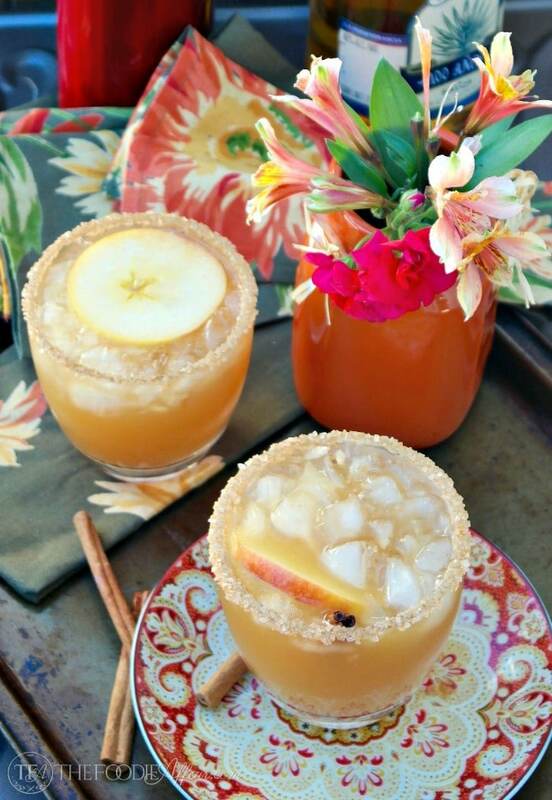 Cozy up with an Apple Cider Margarita this Fall! 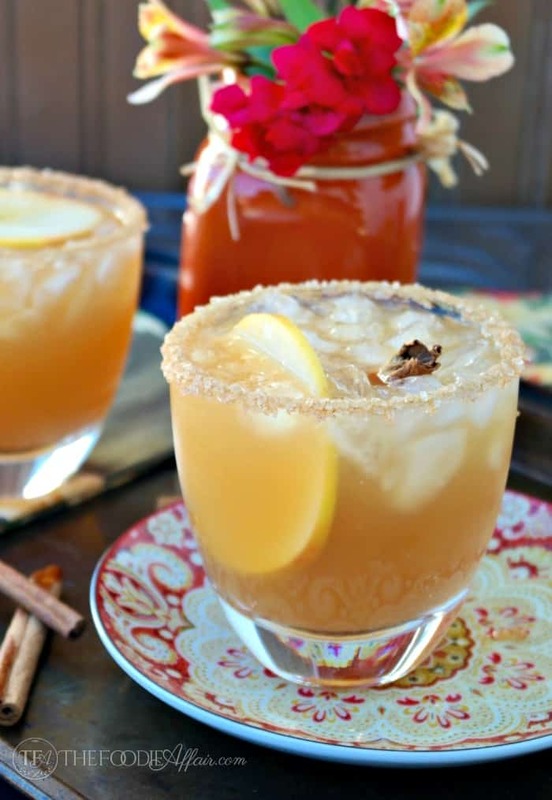 This cocktail is a delicious mix of tequila, orange liquor, and apple cider. A perfect addition for your Thanksgiving gathering. I can’t wait to serve this simple margarita when we gather for Thanksgiving! I love mixing up cocktails for the holidays to enjoy while we’re prepping and putting the finishing touches on our feast. Last year I made Cranberry Cosmopolitans, but this year I thought I would mix together some warm spice flavors. I taste tested this margarita with Alan and Sam and they both reported their approval with high fives. Although Sam did ask if there was any alcohol in his drink! This drink goes down nice and smooth, so there is potential for enjoying without realizing you’re consuming alcohol. Oh, and Sam is spot on, I just may have added a little less tequila to his drink (shhhh). We celebrated Sam’s 21st birthday in September so he’s legitimate for alcohol consumption and more importantly he’s a responsible kid, but I’ll probably always water down his drinks! I do have a couple of tips that I think make this drink extra special. First, I used Cider & Spice 100% juice. R.W. Knudsen carries a preservative free and no sugar added juice that is quite tasty! The juice has extra spices like cinnamon, cloves and allspice that are delicious together. Second, I used tequila that’s 100% Agave, which means that the tequila doesn’t have additional sugars added. You don’t need it with the natural sugars from the juice and the sweetness of the orange liquor. Grand Marnier is more expensive than Triple Sec, but I think it’s worth the splurge! 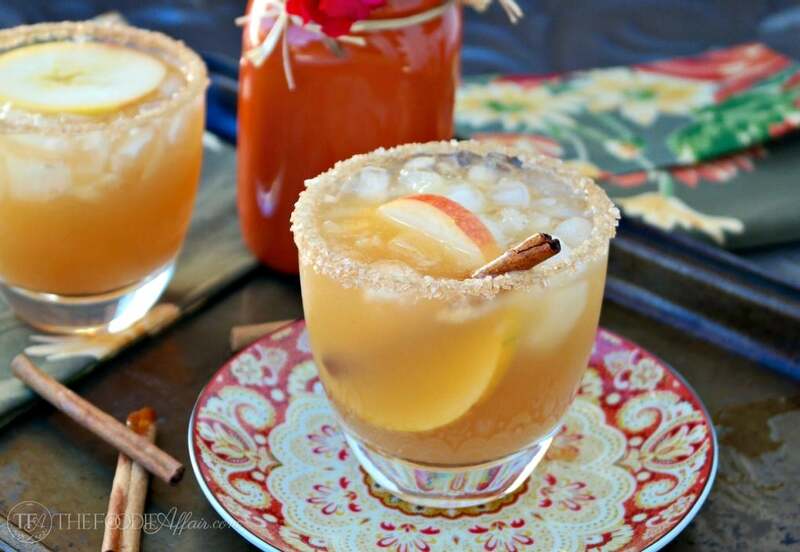 Top your drinks with a slice of apple and cinnamon stick and you have one tasty cocktail! This cocktail is a delicious mix of tequila, orange liquor, and apple cider. A perfect addition for a fall gathering. Dip rim of glass in water (or honey) and place upside down on cinnamon sugar mix. Set aside and add crushed ice to the glass. Pour all ingredients in a shaker filled with ice and shake vigorously for about 30 seconds. 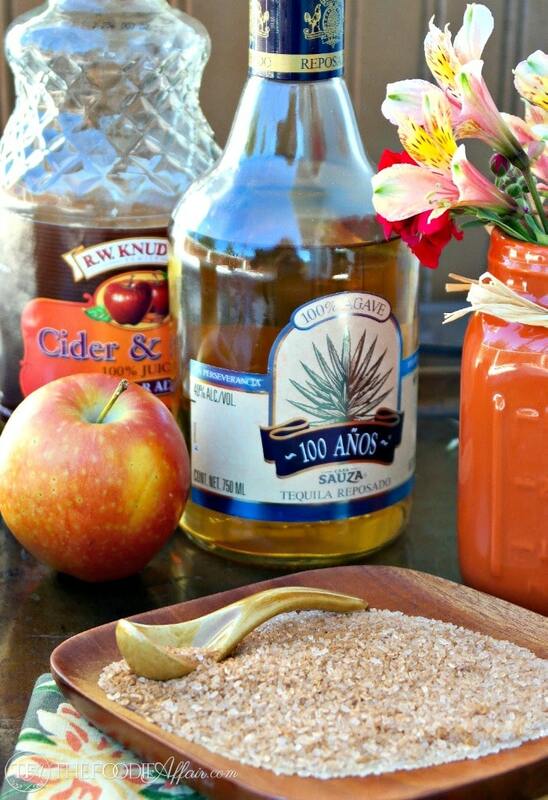 Strain into prepared glass and add a slice of apple and cinnamon stick. Now that looks like one delicious margarita. I have never had one like this before and so perfect for holiday entertaining. Thanks for the inspiration Sandra! Wishing you a super Thanksgiving if I told have a chance to wish you later. Shared, pinned, smoke signals sent! What a fantastic seasonal recipe! This sounds like a lovely adult treat – and the Cranberry Cosmos do too! Thank you, Erica! It’s so fun to mix up some cocktails, especially during the holidays! Ha, your too cute watering down your son’s drink. 😉 I love how you garnished this! He’ll always be my baby — haha! I have to try this recipe. I love margaritas and apple cider. What a great combo. I hope you love it! Christie 🙂 I love the cider spice mixed with tequila! This looks fabulous! Perfect way to get in the spirit of the season! Pinning! Can’t wait to try it! It is a festive drink, just for autumn! 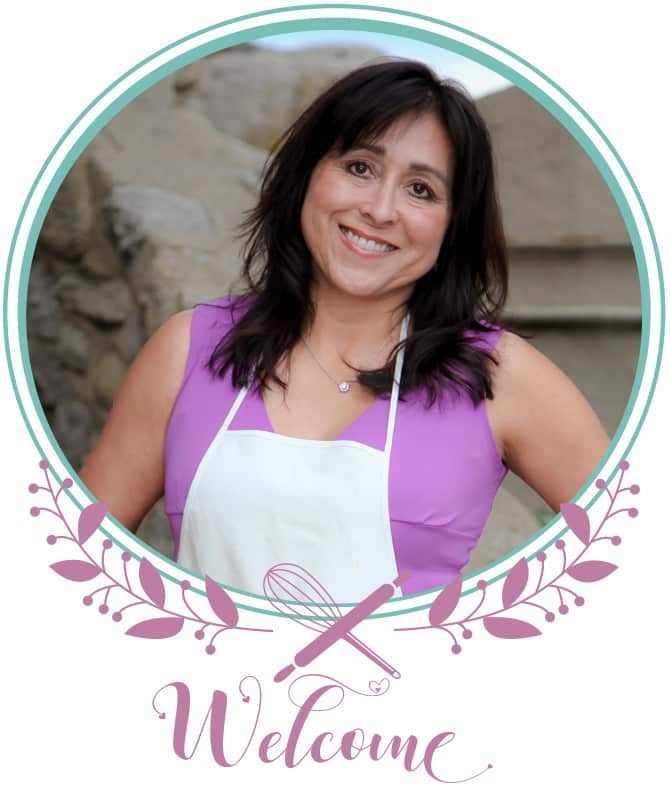 Thank you for the pinning love, Michelle! 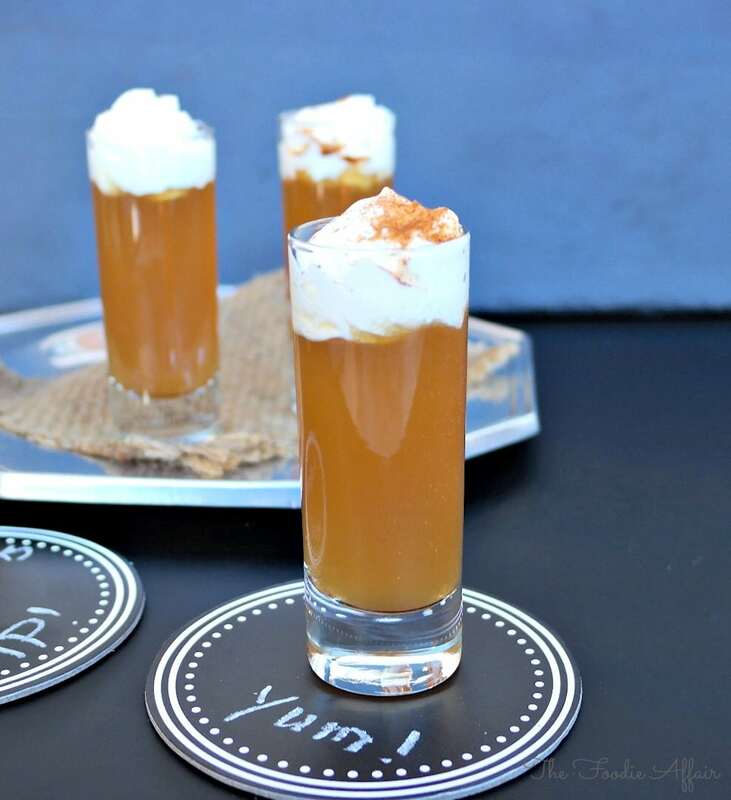 I am all about fall cocktails right now! 😉 This margarita sounds amazing. This is a good one – classic to Fall favorite! Give it a try, Carrie! Thanks, Charlie! It’s fun to mix things up from the traditional! A perfect cocktail for Thanksgiving. I think so! We’ll be enjoying a glass very soon! This looks amazing! I would love to make a pitcher of this for thanksgiving! 2 questions, what are the measurements for a pitcher, and can you get the cider at grocery stores? Yes, most grocery stores carry cider in the juice section. I haven’t made it by the pitcher, but you could add the amount in the recipe x’s 4-5 or any amount of servings your pitcher will hold. Enjoy! I always say holidays and relatives get along better with booze and this is going to be a keeper for my holidays. It sounds amazing and love that it’s not loaded with sugar! 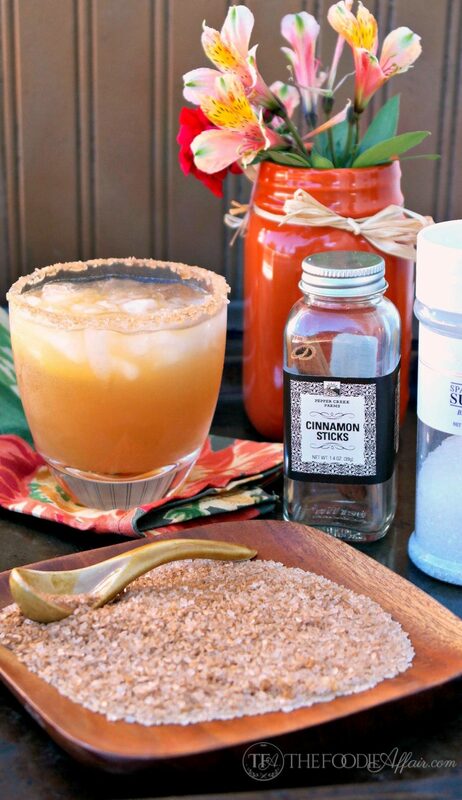 I love this fall twist on a margarita! It’s a perfect cocktail for the holidays! We gave these a test run this past weekend!! They were a HIT!! Thanksgiving menu cocktail *check! !